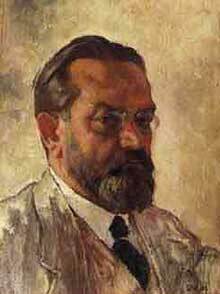 Almost all the considerable in-depth information to be found about Emil Orlik is written in German. To enhance knowledge of this unique and important artist whose career spanned almost fifty years from the 1880s to the 1930s, Limited Edition Graphics in London have collected together biographical material which is presented here in English. Orlik's prints and some related images have been placed in categories which make it easy to follow the progress of Orlik's work. Inventory items can be found at the top of the thumbnail image pages of each category, followed below by archival material of prints previously sold or scanned from diverse sources. We hope that you will find the site interesting and informative.